Let Gary watch your favorite listings and alert you if they change. Have Gary save your favorite search parameters for quicker searches. Gary is free and easy to use! If you find a listing you are interested in, you can have Gary watch the listing for you. You can tell Gary to EMail you if the status of the listing changes. Any change to the listing, such as a price change, or change to the description, will alert you that the property has been modified. You can also tell Gary not to EMail you. Gary always remembers the listings you are watching and lets you quickly check them each time you visit the Hilo Brokers website. Too busy to visit Hilo Brokers every day to see what's new? 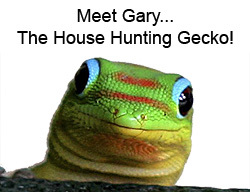 Let Gary Gecko search new listings for you. If you select this feature, once a day Gary will search all of your Quick Search profiles. If new listings match they are EMailed to you to let you know that a new listing is available. Remember that your EMail Address is also your Gary Gecko Login. Hilo Brokers does not make your EMail Address available to 3rd parties. You can also check your Watched listings by visiting the website. listing that you are watching changes.